Vice President Joseph Biden is meeting Monday with Costa Rican President Oscar Arias and other Central American leaders to discuss U.S. aid to the area, the war on drugs and the global economic downturn. Stagno expressed optimism about the new Obama administration. “We think it’s opportune for the United States to have a positive agenda with Latin America,” Stagno said in a televised interview with CNN affiliate Teletica. “We need to turn the page on an agenda that was mostly negative.” Tomas Duenas, the Nicaraguan ambassador to the United States, said the agenda for Monday’s talks will include financial matters, economic development, human rights, security, immigration and other common areas with the United States and the region. 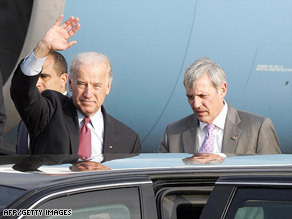 Biden is scheduled to return Monday evening to Washington.